Hollandia carries a huge selection of vegetables for both the professional grower and the everyday gardener, including seed displays and several varieties of peppers, tomatoes, and squash. We also have thousands of pots of herbs to choose from, all grown right here at Hollandia. From A-Z, for sun & shade, Hollandia offers one of the largest selections of flowers in the region. We grow over a million annuals and over 200,000 perennials each year right here on our Bethel premises. We also have lots of variety with over 1,200 varieties of perennials. From dwarf ornamental trees to white pine used for maximum screening & privacy, we'll gladly install trees on your property to suit your needs. From pottery to exquisite ornamental statuary, Hollandia will help you give your gardens the finishing touch. Much of our statuary is manufactured by Campania International, located in Quakertown, PA.
We carry any and all kinds of seeds to match your needs. Feel free to consult with any of our expert representatives with questions about proper growing conditions. 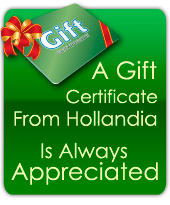 Also check out Hollandia's own brands of plant food and fertilizer to ensure the health of your plants. Our garden shop features distinctive garden accessories such as bird houses, weather vanes, wreaths, planters, baskets, wind chimes, hummingbird feeders, and ornamental items, as well as a huge collection of terra cotta pots. © 2019 Hollandia Nurseries | Web Site by River Design.